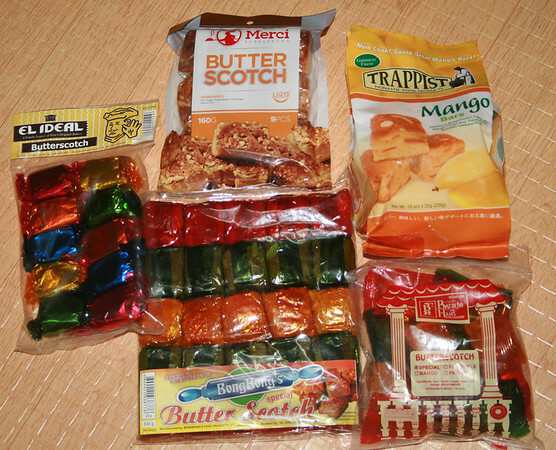 My friend who hies from Bacolod says that the best butterscotch ever are sold from a house owned by a certain Emily Lacson at J. Pitong Ledesma at Silay City (very near the El Ideal Bakery). They also supposedly sell the best fresh lumpia. We were however pressed for time so we didn't look for it anymore and just opted to shop at El Ideal, the oldest bakery in Negros, when we were at Silay. 1) The mango butterscotch from Trappist is, of course, only sold in Guimaras. It also happens to have the longest shelf life of the five (expires in May) and is actually the toughest and least delicious. Sorry. 2) Biscocho Haus' butterscotch is softer and better than Trappist's. However, you can sometimes get some that are a little tougher than what you expect (maybe those slices coming from the edges). Expires within a month. 3) Bong-bong's butterscotch is better than Biscocho Haus' (and if you buy it from Bacolod, it may be P5-10 peso cheaper per pack). Expires within a month and comes in a P90/pack (around 25 pieces). 4) Merci, of Napoleones fame, offers really wonderful butterscotch and is the second best of the lot. Expires within 3 weeks. 5) Unsurprisingly enough, El Ideal's butterscotch is to die for and the best of all five. It isn't too sweet and just the right chewiness, maybe because it isn't as mass produced as the others. However, it's packaging doesn't bear any expiry date and I assume it has the least preservative so better to feast on it asap. If you're not going anywhere near Silay and therefore can't try El Ideal's... may it comfort you that there are a lot of Merci bakeshops around the city of Bacolod. There is even one at the airport. A huge Bong-bong's Pasalubong Center is just outside the Bacolod (Silay) airport... and just like Biscocho Haus, you can also find them inside SM or Robinson's.